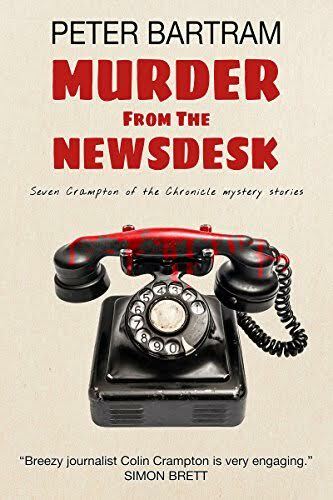 Join Colin Crampton, ace crime reporter on the Evening Chronicle in 1960s Brighton, England in seven cozy crime mysteries. The Mystery of the African Charity: Amateur sleuth Colin discovers greed - and a murder mystery - behind what looks like a good deed. The Mystery of the Two Suitcases: Colin interrupts a romantic Valentine's date with girlfriend Shirley Goldsmith to unravel a case where love will find a way. The Mystery of the Single Red Sock: Colin's act of heroism plunges him into the hunt for one of the most violent criminals he's ever confronted. The Mystery at the Beauregard Hotel: Colin investigates when two guests disappear unexpectedly in this humorous crime mystery. The Mystery of the Precious Princess: Colin finds that it's not only a dog's life for the canines up at the Greyhound Racing stadium. The Mystery of the Clothes on the Beach: in another cozy crime story, a local fisherman helps Colin land a surprising catch. The Mystery of the Phantom Santa: Colin uncovers more than he bargained for when he goes in search of a front-page crime story with a Christmas theme. This book of cozy mystery stories will keep you smiling to the very last page.